Industry experts have reacted to the Government’s Agriculture Bill, in what would be the biggest shake-up of farming for decades. The current system of subsidies paid for the amount of land being farmed would be phased out over a seven-year period, between 2021 and 2027. 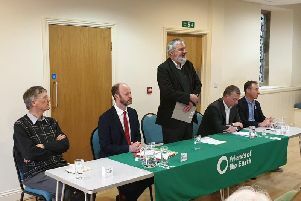 There would be a shift towards ‘environmental land management contracts’, which could span several years and see farmers paid for improving air and water quality, boosting wildlife and habitats and tackling climate change. But ministers have not specified how much public money farmers would receive under the reforms. Reacting to the Bill – introduced to Parliament last week – Andrew Jamieson, partner at George F White, said: “While the seven-year transition, beginning in 2021, is welcome, it is clear by the end of this period things will be different. “We will have two years in advance of this to take advantage of the current direct payment system. I would encourage farmers to use this period to have a look at their business, taking subsidy payments out of any calculations. “Some will focus on production and take advantage of the future funding opportunities for investment, innovation and efficiency, while others will focus on the environment, air and water, taking advantage of non-direct targeted payments for delivery of public goods. NFU president Minette Batters said: “UK farmers will be concerned that the Bill provides only a short-term commitment to improve their competitiveness; we cannot future-proof farming businesses based on the time-limited initiatives outlined in this announcement. We will look at the proposals for a seven-year transition, to ensure we’re satisfied this will be sufficient. “The Bill must provide Government with the powers to pause the process if it is proving unmanageable for farmers.